"Time and Tide" at the online journal Ascent. Walt Whitman’s meditation on time is the undercurrent running through Postscripts, a series of reflections on finding one’s place in the endless chain of time. In linked essays, Robert Root ranges across American terrains and landscapes including locales as varied as Walden Pond and Mesa Verde, the mountains of Montana and the coastline of Maine, Great Lakes shorelines and Manhattan on the first day of the war with Iraq. Three of the essays in Postscripts have been cited as Notable Essays in the annual Best American Essays collections. 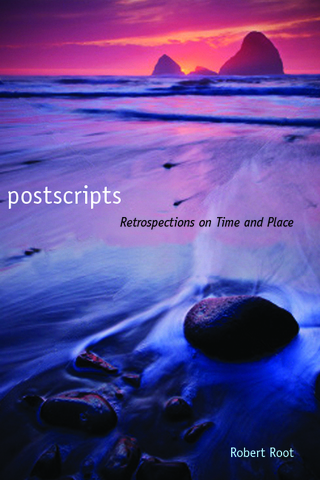 Rich in “all that retrospection,” Postscripts chronicles moments of intimacy and arrival in the natural world while also charting intersections of natural, cultural, and personal history. Whether revisiting the first European settlement in Nova Scotia or seeking out the sites of E. B. White’s life and literature, exploring the only old-growth forest in Lower Michigan or shifting perceptions at the birth of a granddaughter, Root offers readers a new perspective on the relationship between time and place, time and timelessness, history and personal history. If the past is prologue, his book suggests, the present is postscript.